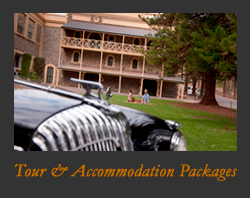 Watch the Luxurious Barossa Indulgences article. "This is a one man roadshow." Susan Kurosawa, The Weekend Australian. "The ride quality is excellent and, combined with John's entertaining commentary, is worth the trip alone. The knowledge gained makes terrific fodder for dinner parties back home. It's almost worth travelling to Australia for this alone." Jim Patten, Executive Editor, Jaguar World Monthly. 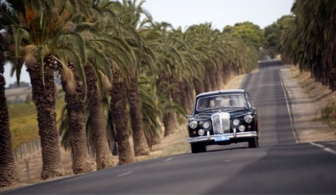 "Fancy a wine-tasting tour of the Barossa in a vintage Daimler with a food and wine buff at your disposal? John Baldwin is your man!" "Mr Baldwin is well versed and infectiously enthusiastic about the local history including the winemakers specialties." "John Baldwin knows all the best spots for food, wine or sightseeing." Mike Frost, (Brisbane Courier Mail). "John Baldwin knows what he's talking about." "John Baldwin is a font of knowledge and keeps you entranced with amusing anecdotes and fascinating facts." "Your guide, John Baldwin, has a tremendous wine knowledge, knows every winemaker and his enthusiasm for the Barossa is infectious." "With each tour, John shows as much passion for the wines and the history surrounding the region? his line of knowledge doesn't stop at the vines. Ask about cheeses, olives?" "John's passion for the valley and its produce is equalled by his enthusiasm? his knowledge of wines and the people who grow them are formidable." "This is sophisticated travel with John Baldwin, an expert wine guide who is respected by the industry and who’ll arrange tastings and visits that match your interests. And introduce you to the history and life of these beautiful regions".